Approx - 9.85(W) * 5.52(H)* 3.54(D) Inches - Fit Neverfull PM perfectly. Approx -10.63(W)*7.88(H)*5.1(D)Inches - Fit Neverfull MM perfectly. Approx -13.39(W)*9.05(H)*5.9(D) Inches - Fit Neverfull GM perfectly. A must have outing essentials for your purse, handbag, tote, diaper bag, etc. 2: Very light weight - less than 15 ounces empty for carrying. 3: Universal fit & Add volume to your handbag - various size & color options perfect for any brand. LV speedy 25 Dimensions is:(W)10.1"*(H)7.5"*(D)5.9"
LV speedy 30 Dimensions is: (W)11.8"*(H)8.3"*(D)6.7"
LV speedy 35 Dimensions is: (W)13.8"*(H)9.1"*(D)7.1"
LV speedy 40 Dimensions is:(W)15.79" *(H)9.8"*(D)7.5"
Please refer to the size chart to choose the most well-fitting one for your purse, handbag, tote bag, diaper bag, etc. CLICK ADD TO CART! Buy More! Save More!The perfect gifts for your family and friend. 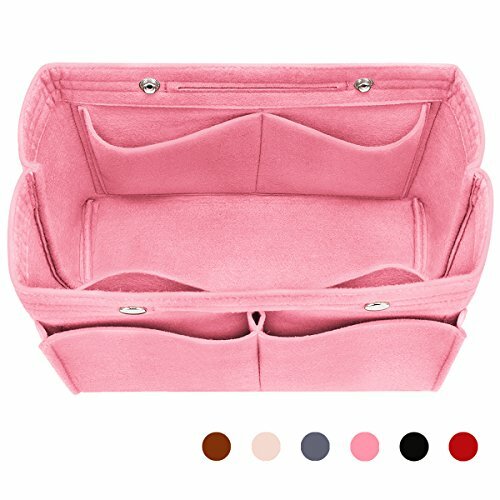 ♥STAND ON ITS OWN & WELL ORGANIZED: Thick felt fabric, no odor, sturdy base (prevents bag sag well) & light weight, well constructed, protect your items inside handbag. Keep your Handbag shape and shipshape. Enable you to store the items in easy to reach compartments, and significantly reduce movement and tumbling. Easily transports your essentials to any handbag without any hassle. ♥ADD VOLUME to YOUR HANDBAG: Small - 9.85"(W) * 5.52"(H)* 3.54" (D) -Fit Neverfull PM perfectly; Medium -10.63"(W)* 7.88"(H) * 5.1"(D)- Fit Neverfull MM perfectly;Large - 13.39"(W) *9.05"(H) *5.9"(D)- Fit Neverfull GM perfectly. 4 exterior pockets, 4 interior pockets,keep your items orderly and well organized.This awesome felt purse organizer filled with healthy, plant based beauty and wellness, it's the most excellent gift that wows for your friend and family. ♥UNIVERSAL FIT: Portable and Compact. Purse perfecter for any brand, such as: LV speedy 30, speedy 35, speedy 40, Neverfull MM, Neverfull PM, Neverfull GM, Artsy MM, Artsy GM. Longchap Le Pliage tote, MK, LV petit noe, Gucci, etc. There is literally a spot for everything you need. Pretty easy to swap bags without any hassle. ♥GENERAL APPLICABILITY: Could be used as, handbag organizer, purse organizer, diaper bag organizer insert, pocketbook organizer, etc. Carry all your stuff neatly & orderly (wallet, Calendar, glasses, pens, makeup case, iPad, MacBook Air, notebook, file folder). Perfect choice for any occasion, such as Travel / Home / Outdoor / Bashroom /Toilets / Hospital, etc. ♥LIFE TIME WARRANTY: All Hokeeper purse organizer come with 1 year hassle-free warranty. Contact us if anything comes up and we will do our best to get it done in 24 hours.We guarantee 100% satisfaction after-sale service for this item. Please rest assured to buy! If you have any questions about this product by Hokeeper, contact us by completing and submitting the form below. If you are looking for a specif part number, please include it with your message.